WASHINGTON – Justice Ruth Bader Ginsburg returned to the Supreme Court on Tuesday, approx. two months after cancer surgery. In the meantime, she had missed arguments in her first absence since she came to court in 1993, but had continued to participate in court rulings by reading briefs and transcripts. Tuesday's argument was technical, considering whether the federal government can challenge patents in a specialized court. Justice Ginsburg asked sharp and clear questions from both sides, and she seemed to express skepticism about one aspect of the government's argument. "The government effectively gets two bites from the apple," she said, characterizing the proprietor's argument in the case, Return Mail Inc. v. United States Postal Service, No. 17-1594. "Everyone else only gets one." 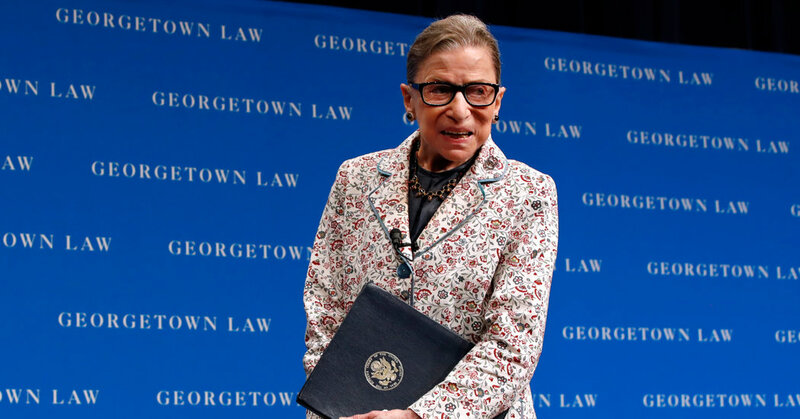 The Court has said that post-operative evaluations have shown that Justice Ginsburg, who is 85 years old and has suffered a series of setbacks over the years, is cancer-free. Before justices took the bench, the Supreme Court made a decision in a death penalty case and agreed to hear a case of water pollution. In the capital case Moore vs. Texas, No. 18-443, the court ruled that Bobby James Moore, a death killer in Texas, was intellectually disabled. Although the court did not say so with so many words, its judgment was effectively reversed on Moore's death sentence, as the 2002 decision in Atkins against Virginia prevented the execution of the intellectually disabled as a violation of the eighth amendment's ban on cruel and unusual punishment. Mr. Moore has been in death since 1980 to kill a 72-year-old Houston supermarket consultant, James McCarble, during a robbery. The unsigned decision followed a 2017 decision by the Supreme Court in the same case. By a 5-to-3 vote, the court instructed the Texas Court of Criminal Appeals to take a fresh look at the case and said it had not followed the current medical consensus, stood too strong on I.Q. score and take into account factors rooted in stereotypes. Last year, the Texas Court confirmed its previous decision and Mr Moore again appealed to the Supreme Court. In Tuesday's decision, the majority expressed frustration with the state law. "In our opinion, we have found too many cases where, with slight variations, it repeats the analysis we had previously liked, and the same parts are critical to its ultimate conclusion," said the majority. Chief Justice John G. Roberts Jr., dissenting in 2017, this time joined the majority. Justice Samuel A. Alito Jr., joined by Justices Clarence Thomas and Neil M. Gorsuch, dissented, saying that the majority had exceeded its authority by making factual rather than legal provisions. Justice Brett M. Kavanaugh did not notice a disagreement and presumably adopted the majority. Also on Tuesday, the Supreme Court decided to hear a case concerning the scope of the Treatment Act. The court will decide whether Maui County in Hawaii needs a permit to indirectly dispose of treated wastewater in the Pacific. Lower courts are divided into whether permits are required when pollutants travel underground, reaching a sea, river or other waterway. The American Appeal Court for the Ninth Circle in San Francisco rose to the county. "At the bottom, this case is about preventing the county from indirectly doing what it can't do directly," Judge Dorothy W. Nelson wrote for a unanimous three panel of judges. "To keep otherwise would make a shame" of the Clean Water Act. The Trump administration had called on the Supreme Court to hear the case, Maui County, Hawaii Wildlife Fund, No. 18-260.